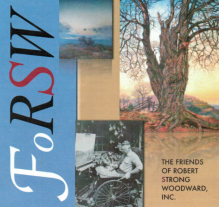 RSW- Artwork page, "Out of The Past"
Painted in summer of 1930. 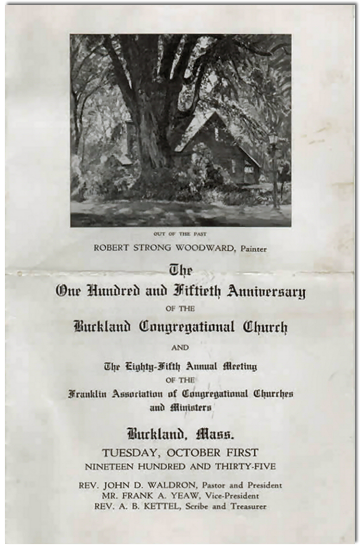 "My first painting of the old Hitchcock Elm in old Deerfield." RSW Another first, RSW's first painting sold by MacBeth Gallery. See also Hitchcock Elm to view related piece. See also August Shade to view related piece. "Painted in summer of 1930. My first painting of the old Hitchcock Elm in old Deerfield. The house, once the studio of George Fuller, now owned by his son Arthur Fuller. Sold from my first Macbeth Gallery Exhibition to Mr. and Mrs. Francis M. Whitehouse of New York and Manchester, Mass. (Mr. Whitehouse, 1942 died a few years ago." Sold June 12, 1933 to Mr. and Mrs. Francis M. Whitehouse through Macbeth Gallery, N.Y. city for $450.00....less 33 1/3... $300." 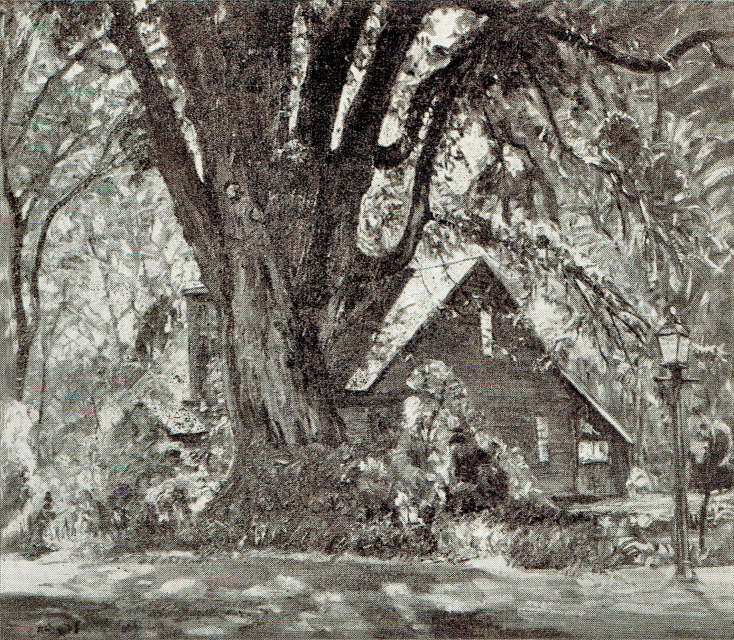 "Out of the Past was painted this spring and has a particular appeal to Deerfield, for it is a study of the 'Hitchcock Elm.'" See also August Shade, a very similar painting of the Hitchcock Elm. from around the time Woodward painted it. 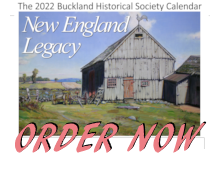 The house seen in this painting was built in 1783, on a tract of land that in 1686 was designated as Deerfield communial land until 1759 and is affectionately referred to as "The Little Brown House" on Albany Road in Old Deerfield near the Academy. By the 1880's and '90's the house was in terrible condition. 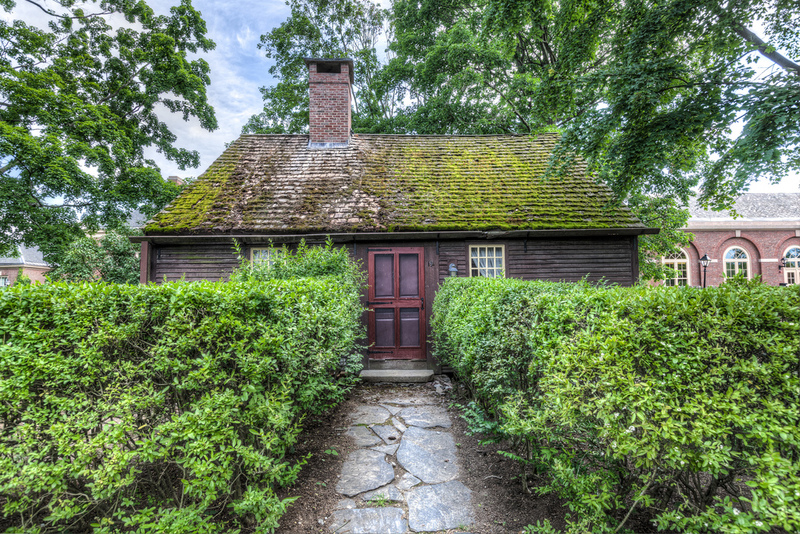 In 1890, George Sheldon a 'Preservationist' and founder of the Pocumtuck Valley Memorial Association (1870), one of the first preservation societies in the country wrote and published a book on the home's history and restoration titled The Little Brown House on Albany Road. 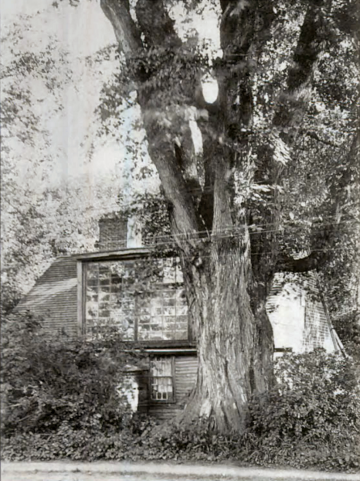 The Elm Tree along the house derives its name from the numerous 'Hitchcocks' that lived there throughout its history, the most prominent being Edward Hitchcock who taught at the Deerfield Academy, rising to become its principle (1815-18) and then on to teach at and become the president of Amherst College in 1845. The bookstore at the academy is named after him. One can read The Little Brown House on Albany Road in its entirety on this link to the Smithsonian Library website.